Limited edition box set from the world's biggest Death Metal act. An excellent box set for the price. Cannibal Corpse certainly isnt for everyone, but those who appreciate technical, tight, loud death metal cant go wrong with this set. 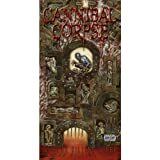 Lots of good studio versions of their best songs and some nice rarities and demos to go along with a poster a really cool booklet and a Cannibal Corpse guitar pick make this a really great box set to have. Some of the songs on the DVD are of rough quality but its still cool to see them way back in the begining playing live.